The hits keep coming for Nebraska with the latest news that freshman wide receiver Jaevon McQuitty is out for the season after undergoing knee surgery. It’s not often a team with a pair of upperclassmen entrenched as its starting X and Z guys really feels the effects of an injury to a freshman, but that’s where the Huskers find themselves. With six scholarship wide receivers left standing and very little experience to go around, Nebraska is in a strange spot just a week into fall camp. A quick look at the scholarship guys left at wide receiver for Nebraska: senior De’Mornay Pierson-El, junior Stanley Morgan Jr., junior Keyan Williams (who is also on the shelf for the next two weeks), junior Zack Darlington, redshirt freshman JD Spielman (also dealing with an injury) and freshman Tyjon Lindsey. An even quicker look at the numbers that group brings to the table: 1,603 total receiving yards, eight total touchdowns. Remove Pierson-El and Morgan, and those numbers drop to 34 total yards and zero total touchdowns. Darlington has been a quarterback and kick holder for the Huskers. Williams – who owns the entirety of those 34 yards from his days playing at Fresno State – has yet to catch a pass in a Nebraska uniform after transferring in 2015 and sitting out all of 2016. Spielman and Lindsey have yet to even step foot on a field when the games count. Should the Huskers turn to the tight end spot? Maybe. 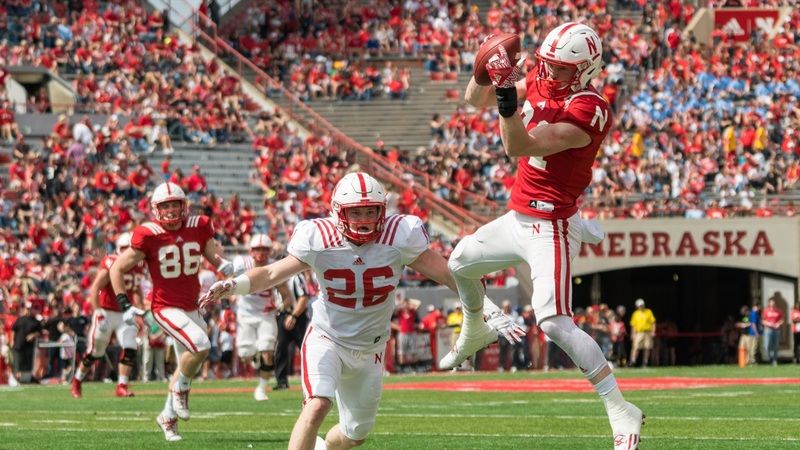 Nebraska has hinted at its desire to revitalize the tight end position in coach Mike Riley’s offense already during this preseason, and senior Tyler Hoppes has raised some eyebrows during fall camp with his play. But even he has yet to catch a pass for Nebraska. The Huskers graduated their top three tight ends on the depth chart from a season ago and currently have five freshman on the roster. Now, I know McQuitty was also a freshman and has yet to provide any material for his Sports-Reference.com page, but that’s not really the issue at this point. With only two established receivers, the Huskers are praying for two things this season. First, Pierson-El and Morgan avoid the injury bug. Second, they hit the lottery on one of quarterback Tanner Lee’s fresh-faced targets. Nebraska has a couple options moving forward, and receivers coach Keith Williams acknowledged that much after practice Thursday, saying that everyone in his room prepares like they’re one play away from getting in the game. In all likelihood, Lindsey will be a solid weapon for the Huskers this season. He’s a talented speedster who has developed a strong relationship with Williams and quickly grasped the offense. As a junior in high school – his senior year was shortened by injury – Lindsey hauled in 1,117 yards and 14 touchdowns. Obviously, the production won’t be the same, but the talent is there. Tabbing him as a breakout player would be the type of “bold prediction” that’s gets you laughed at. Spielman could join that category as well. A name to watch, though, is walk-on Gabe Rahn. Rahn had just one catch last season, but it was a good one to have – a 35-yard touchdown catch. If there’s a guy that has a real shot to walk onto the field (pun intended) and make an impact, it’s Rahn. At practice Thursday, he was one of the first receivers to see the field, lining up in the slot with the first team unit. Another name to keep an eye on in the receiving corps is Bryan Reimers. Reimers caught five passes as a sophomore last season for 75 yards and a score, but it’s his size that demands the attention. At 6-foot-5, 210 pounds, the Lincoln native is a monster target for Lee to have at his disposal. Whether it’s jump balls deep in the red zone or crossing patterns over the middle, Reimers is a guy who could become a nice utility option for Nebraska. Alarms aren’t sounding in Lincoln, yet, but Nebraska can’t afford any more attrition to its receiving corps.